The Amish Vintage Double Pedestal Table is a popular double pedestal table with its contemporary look and solid wood quality. From the Bontrager Dining Collection, this dining table is Amish made in northern Indiana. The pedestal base is a sight to see, with rounded columns angled beautifully and splayed feet reaching out from the center of the base. You can become involved in the final product. Our Amish dining tables come in many sizes with features to serve your needs. This vintage beauty is available in six sizes. Customizing your dining table brings home the exact table you've envisioned--the one your loved ones are gathered at for daily meals and special occasions. With options to choose from like wood type, finish color, table top thickness, extensions, table edge style and more, you are getting a table custom made for your family that won't be like all the others purchased from big box stores. It's also Amish made with solid wood, providing a quality heirloom table that will last for generations. 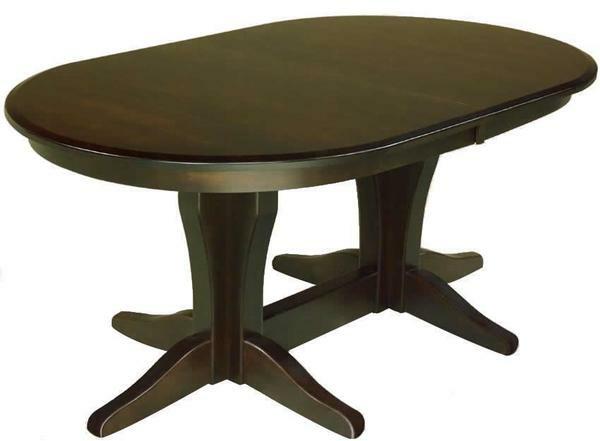 You can ask our dedicated Furniture Specialists any questions about dining tables or any of our Amish furniture. They love to hear your stories and your plans for your new furniture. They can be reached by email at Questions@DutchCrafters.com or Toll-Free at 866-272-6773. Thank you for shopping DutchCrafters. As i said at first..
And so happy with the end results!